Governor Andrew M. Cuomo today launched a landmark $20 billion, five-year plan to combat homelessness and advance the construction of affordable housing in New York State. The action plan is made possible by the release of $2.5 billion in capital funding delivered in the FY 2018 Budget which will create and preserve more than 110,000 units of affordable and 6,000 units of supportive housing over the next five years. This marks the largest investment in the creation and preservation of affordable housing and efforts to end homelessness in the history of New York. 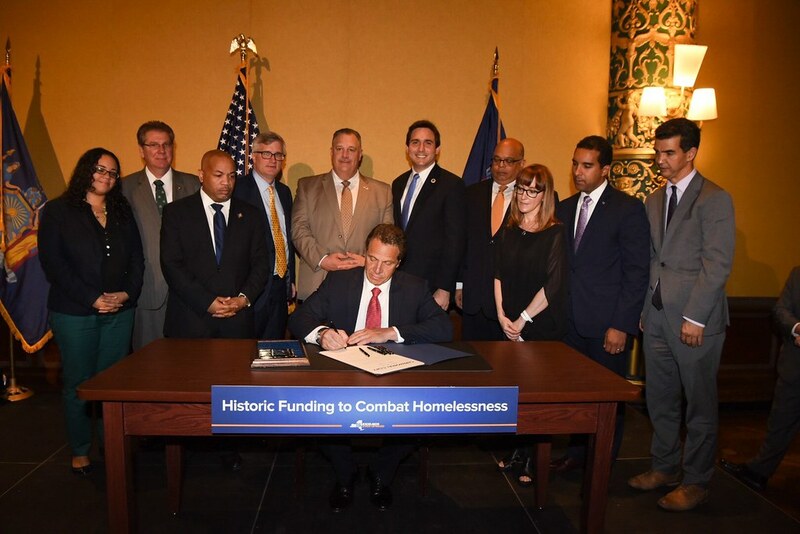 "This legislation is a major step forward for New York as we strengthen our efforts to combat homelessness and expand access to quality, affordable housing for our most vulnerable men, women and children," Governor Cuomo said. "By making significant investments in rehabilitating, preserving and constructing safe and affordable housing, we will open doors for low-income residents and support hard-working New Yorkers in every region of the state." "Providing New Yorkers with truly affordable housing has long been a cornerstone for the New York State Assembly Majority’s Families First agenda," said Assembly Speaker Carl Heastie. "The cost of living in New York has left many of our most vulnerable residents homeless or in jeopardy of homelessness and this legislation will help us stem the tide and make meaningful change in our communities. Safe, secure and affordable housing is essential to our communities, and I would like to give special thanks to Assemblymember Cymbrowitz, chair of the Housing Committee, and to all the Assembly Majority for their continued commitment to this issue." The new legislation provides $2.5 billion in funding to advance the Governor’s $20 billion, multi-year homelessness and affordable housing plan. To add critical supply to the state’s stock of affordable housing, the plan commits $10 billion to create and preserve more than 110,000 units across the state, including approximately 12,000 units created through the newly enacted "Affordable New York" program formerly known as 421-a. The plan also includes a $10 billion landmark commitment to create 6,000 new supportive housing beds, including $7.5 billion to end the homelessness crisis and support housing programs, rental subsidies and other shelter costs in New York City and across the state. By making significant investments in rehabilitating, preserving and constructing safe and affordable housing, we will open doors for low-income residents and support hard-working New Yorkers in every region of the state. Supportive Housing: $950 million for the construction or operation of at least 6,000 supportive housing units throughout the state. New Construction: $472 million for new construction or adaptive reuse of rental housing affordable to households that earn up to 60 percent of area median income. New York City Housing Authority: $200 million for projects and improvements related at housing developments owned or operated by NYCHA. NYC 100% Affordable: $100 million for the construction and preservation of 100 percent affordable units in New York City. Senior Housing: $125 million for developing or rehabilitating affordable housing targeted to low-income seniors, aged 60 and above. Rural and Urban Community Investment Fund: $45 million for mixed-use affordable housing developments that may include retail, commercial or community development components. Middle Income Housing: $150 million for new construction, adaptive reuse, or reconstruction of rental housing affordable to households that earn between 60 percent and 130 percent of AMI. Affordable Housing Preservation: $146 million for substantial or moderate rehabilitation of existing affordable multi-family rental housing currently under a regulatory agreement. Mitchell-Lama Rehabilitation: $75 million to preserve and improve Mitchell-Lama properties throughout the State. Public Housing: $125 million for substantial or moderate rehabilitation and/or the demolition and replacement through new construction of public housing authority developments outside of New York City. Small Building Construction: $62.5 million for rehabilitation and/or the demolition and replacement through new construction of buildings of 5 to 40 units. Home Ownership: $41.5 million for promoting home ownership among families of low and moderate income and stimulating the development, stabilization, and preservation of New York communities. Mobile and Manufactured Homes: $13 million for mobile and manufactured home programs. Main Street Programs: $10 million for stimulating reinvestment in properties located within mixed-use commercial districts located in urban, small town, and rural areas of the state. In addition, the FY 2018 Budget continues the Governor's commitment to provide supportive housing resources and services to address vulnerable populations experiencing or at risk of homelessness. Launched in 2017, ESSHI is a five-year program designed to fund the service and operating costs of at least 6,000 units of permanent supportive housing and to better coordinate resources from multiple-state agencies allowing more dynamic programming and quicker implementation. Services offered through this initiative include employment and training opportunities, parenting education, counseling, independent living skills training, primary healthcare, substance use disorder treatment and mental health care, child care, and benefits advocacy are examples of what is provided to supportive housing tenants. In 2016, New York set a record for financing the creation or preservation of more than 17,000 affordable homes and apartments and was the number one bond issuer in the nation with $2.8 billion issued. New York State Homes and Community Renewal's Unified Funding housing round awarded more than $122 million for affordable housing in urban, suburban, and rural areas of New York. The awards are set to build or preserve nearly 2,000 affordable apartments and leverage more than $450 million in public and private resources. Senator Betty Little, Chair of the Senate's Housing Committee, said, "I am very pleased with all we've accomplished in this year’s budget for individuals and families in need of affordable housing throughout our state. I spent many months last year and this year meeting with stakeholders and in discussion with our partners in government. This is a lot of funding and we wanted to get it right. By doing so, we have achieved a comprehensive housing plan that will not only touch but, in many cases, transform lives for the better. I am eager to see the progress made in the years ahead as this five-year plan is implemented." Assemblyman Steven Cymbrowitz, Chair of the Assembly's Housing Committee, said, "A secure, affordable place to live is vital to every family's health and stability. This bold plan demonstrates our commitment to funding services and programs that help ensure that all New Yorkers, including our most vulnerable residents, have a place to call home." Gary LaBarbera, President of the Building and Construction Trades Council of Greater New York, said, "We're thrilled to join Governor Andrew Cuomo today to sign Affordable New York into law. The Governor fought and won the battle to make sure that affordable housing is built in the state of New York, and most importantly, he made sure it will be done with highly-skilled union labor. Affordable housing has been a major focus of this administration since day one, and we commend Governor Cuomo for having the vision to make Affordable New York a reality. The legislation will support good middle class jobs and creates standards and safeguards for hard working New Yorkers. As we employ our brothers and sisters to help build a stronger New York with these housing units – we are also one step closer to eliminating homelessness." Mario Cilento, President of the New York State AFL-CIO, said, "This legislation will not only create badly needed affordable housing, but the men and women who do the work will be paid a fair wage that will allow them to live in the very city they helped build. We thank Governor Cuomo for getting all of the sides together and ensuring a fair outcome for all parties involved." RuthAnne Visnauskas, Commissioner of New York State Homes and Community Renewal said, “Today we take a huge step forward in the fight against homelessness and housing insecurity. This groundbreaking legislation builds on Governor Cuomo's unwavering commitment to provide New York families with the opportunity for a brighter future that begins with a safe, affordable place to live. This $2.5 billion, multi-year plan will allow us to create and preserve more than 100,000 homes for people who need them, and breathe new life into communities throughout New York." Brenda Rosen, President and CEO of Breaking Ground, said, "Everyone deserves a home. Breaking Ground applauds Governor Cuomo for this significant commitment that will help so many New Yorkers in need get a second chance at life. We see the transformative effects of safe, stable, affordable housing with on-site support every day. Breaking Ground has helped more than 13,000 New Yorkers escape and avoid homelessness since 1990, but our work is not done and this new $2.5 billion commitment will help all of us do even more for our city's most vulnerable." Laura Mascuch, Executive Director of the Supportive Housing Network of New York, said, "With this funding, New York State has demonstrated a historic commitment to those in our state who are most vulnerable. This funding is a powerful investment in the lives of homeless New Yorkers who long for a safe and affordable place to live where they can take care of themselves and their families and fully contribute to their communities. The supportive housing community congratulates Governor Cuomo for his vision and leadership in enacting a bold supportive and affordable housing program." Jolie Milstein, President and CEO of New York State Association for Affordable Housing, said, "Under Governor Cuomo's administration, New York continues to lead the nation in providing much-needed affordable housing for low- and middle-income families. We are grateful to Governor Cuomo and the State Legislature for their unprecedented commitment to affordable housing and we look forward to working with stakeholders across the state to build and preserve safe, quality homes for all New Yorkers."